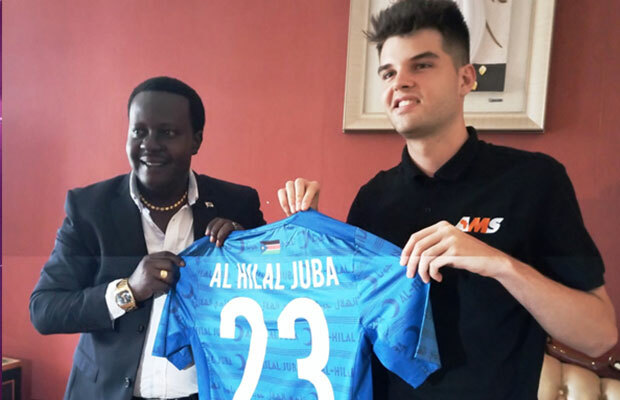 The Champions of South Sudan Cup Al-Hilal Juba football club has signed a two year sponsorship deal with AMS clothing yesterday, to supply the club with jerseys, and source potential sponsors for talented footballers. According to the agreement, the club will benefit from jerseys for the players and for the fans, assist in player development, and sourcing sponsorships for players through bringing in scouts to identify talents. Luke Westcott the director of AMS said AMS clothing will continue to support football development in South Sudan. “Our main goal is to support as many clubs as possible and assist those clubs to continue to expand and fully benefit from the popularity of football in the country,” he said. According to Westcott, football can be used to promote peace, and curb division amongst people. “We want the clubs to develop football, and promote peace and unity through football,” he said. Westcott said the agreement is to make an official partnership with Al-Hilal Juba, and make the football club become powerful in the country, like its other brands in Saudia Arabia and Khartoum. Jacob John Kasim, the Vice President of Al-Hilal Juba football club said with the agreement, they will develop their talents, and work hard to see the club develop like the Hilal’s of Khartoum and Saudi Arabia. AMS Clothing was founded in 2014 with a mission to support football in Africa by supplying uniforms to the strongly supported, yet under-resourced national teams and clubs of the continent. The company also supplies the national team, The Bright Stars, with jerseys. Westcott said his company’s philosophy is to produce ethically and locally while providing players and fans with attractive apparel that proudly represents their club or country.